How to Know Your Home's Worth; Are Valuations You Get Online Spot On?! That meme is all in good fun, it made us laugh. We all love scrolling through our fun phone real estate home apps like Zillow, Redfi n, and Trulia. 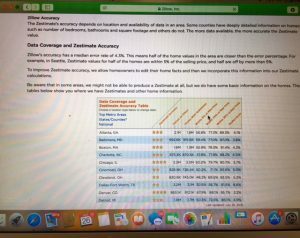 Zillow seems to be most people’s favorite because it is quick and easy and the map is really user friendly to search where you want to be. This blog post isn’t to bash these sites, they all have value; they’re fun to use. They haven’t removed the need of agents, if anything they’ve hurt the need of the office and potential client relationship to come in and meet an agent to help them with a property they saw in their local newspaper. But like most things in today’s day and age the personal touch and communication is more adrift leaving consumers to function very independently in their search for homes and anything else for that matter. The foot traffic in the office is much less due to these technological innovations. The brokers who own the offices still maintain these locations, but now the door mainly revolves for the staff and clients coming in for closings. One thing that frustrates agents and clients alike however, is when the client thinks the online valuations are spot on accurate and it can lead to disappointment. It really is just a misinterpretation and it is not to their own fault as it isn’t their profession to have in depth understanding about. That’s why we thought a blog on this topic could be helpful. So back to, are the valuations you see on a home accurate? Possibly, but they aren’t to be considered as good as gold. Zillow themselves will tell you to contact a real estate professional as you can see in the photograph of their page below. Our Detroit area they rate their accuracy a 3 out of 5 star in the photograph above. So how do these sites get their valuations? It is an automated algorithm to average prices per square foot in your zip code. So that right there is why this is just a starting point. For example in Brighton, Michigan if you have a 48116 zip code, the averages are basing off of homes that can be between $250,000 and $1,000,000 plus. And then factor in if neighborhoods do get accounted for which we’re not so positive they do, (although sometimes they appear to be) an automated system cannot know if one house is a hot mess on the inside while their next door neighbor has completely renovated their home and it’s beautiful inside. However, size,bedrooms, bathrooms, lots size, and everything else compares apple to apple. Should those zestimates be the same? Absolutely not, but they often are. Unless a home remodel is reported to your local tax assessor your remodel will not be factored in. The reason we felt this is an important topic to highlight is it can bring about unnecessary conflict, time wasted, and money lost at the table when an unknowing buyer for example trusts these online valuations to the point that they are then arguing with agents about price negotiations on a home they want to purchase for say 219,000 because the online valuation states it as worth that, but the home is listed for 265,000 due to renovations and landscaping making it worth more. They then for example lose the home they love because they’re too busy negotiating an offer that will never be accepted and someone else swoops in and offers the home’s true worth and gets it right out from under them. Or what about if you want to list your home and you look it up online to see a valuation rather than meeting with a real estate professional (mind you always FREE). And you want to for sale by owner for that price to save the agent’s commission and are then literally tossing money down the toilet where you could have profited more all the while the agent getting the commission they worked hard for you for. A real estate agent knows your area’s ins and outs, and can actually compare your home from inside and out, not to mention location, whether it being of convenience, or a stellar view, certain features today’s buyers are looking for, etc. etc. Sometimes whether doing for sale by owner or working with an agent but wanting to otherwise over price a home just makes it so that the home sits so long on the market , that you have to drop it and drop to the point you are selling it for less than if you would have had it been listed at the right price point to begin with. I know those examples are a mouthful but these things can happen. The Mulvihill Group however will let you know if we don’t think the price you want to list for is right. We are not going to candy coat anything as we want to give you honest information that will be best for you in the long run and put the most money in your pocket in a timely fashion. We will be honest during price negotiating with our buyers too. You can always count on us being upfront and hope that you trust us and know we have your best interest at heart and want to get the deal done fair and quickly. A brief thing to note about searching homes on our website or realtor.com for example is that homes are updated from the MLS every 15 minutes. On these sites / apps, updates are supposed to occur within 24 hours, but we have noted that is not always the case. And it can be situational, sometimes we’ve found 3-7 days behind on these apps. So think about this for example, if a potential buyer gets their heart set on a home they are viewing on a site or app like Zillow, Redfin, or Trulia, just keep in mind that home could be pending and to contact your friendly agent you trust promptly when being serious about the home buying process. These sites not updating as regularly, there could be offers on it, it could be pending, you don’t know, but an agent has the resources to know that imperative type of information within no time. Also, as a sidetone, the premier agents featured at the bottom of a listing on Zillow pay to be featured there and the star rating is based on reviews they get on Zillow because of that paid account and that is where they send their clients to write their reviews / rate them. 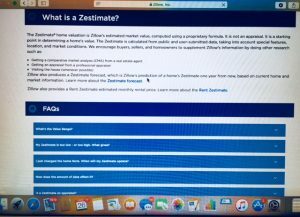 So with every listing you will see featured premier agents that are not the listing agent and the listing agent is mentioned but only has a star rating if they pay to be a premier agent with Zillow, otherwise it will just say listing agent under their name with no stars filled in for their rating. This is just how those apps make their money and an option out there as a lead source for agents. If you want to accurately see how a particular agent is reviewed, you should check Google, and their Facebook page to get that information. In conclusion, use these apps and have fun with them if you enjoy them of course, but just look at the these valuations as a starting point, but the not the end all decision making factor. And remember The Mulvihill Group is backed by over 30 years experience in Livingston County so you can feel safe with us! Call us any time for a free valuation of your home. We have no problem doing so!